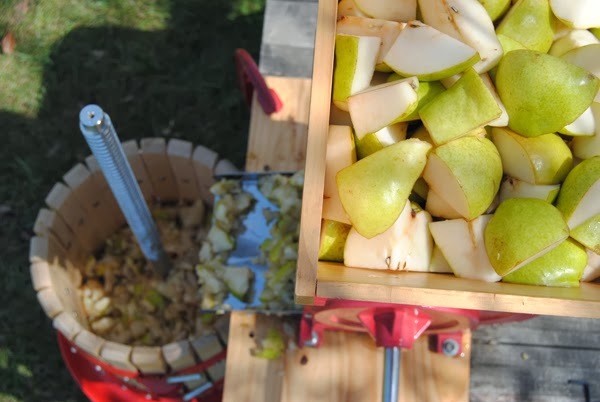 We used our Roma Wine Press to squeeze every ounce of juice we could from fresh, autumn pears, added some fancy cider making stuff, let it sit, and got a crisp, hard cider with a perfect pear finish just a few weeks later. 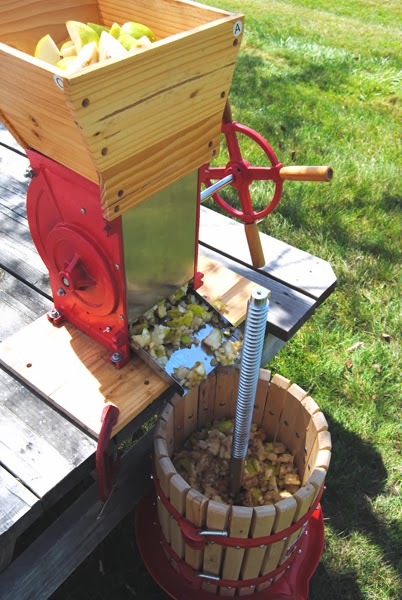 Place your Roma Apple Crusher above the Roma Wine Press. Drop the pears into the crusher and turn the handle to prepare them for pressing. Next, set aside the crusher and place your Wine Press into the elevated spot. Place a bucket below the lip of the wine press. Place your semi-discs over the crushed pears and begin ratcheting the press. As you get close to the cage, you will need to add the wooden blocks. The juice will be pouring out of the cage and into the bucket. Once you have collected all of the juice you are going to get from the pears (when you cannot ratchet anymore), it's time to move on to sanitizing it. You may also use a cheesecloth at this point to strain the juice again, but it was unnecessary for us. Crush the two campden tablets and drop them into the bucket with the juice. Mix well. Place the lid onto the bucket and allow to sit for two days. 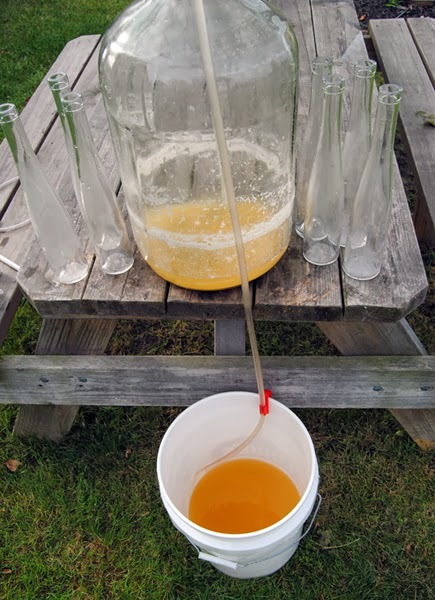 After two days, use a hydrometer to measure the initial specific gravity of your cider. Be sure to write that number down and keep it for the end of your fermentation process. 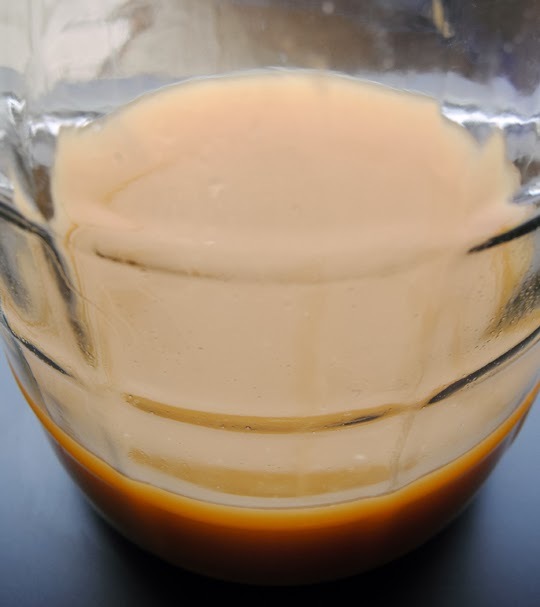 Boil one cup of water, then add one teaspoon of yeast nutrient. Remove from heat and stir. Add in 1/2 teaspoon pectic enzyme. Pour the nutrient and enzyme into your juice then pitch your yeast according to the directions on the packet. If your bucket is a fermentation bucket, simply cover and attach your sanitized airlock. 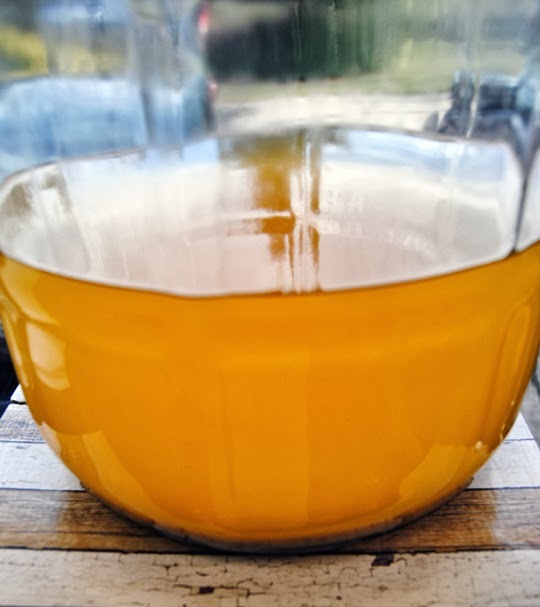 If using a carboy, siphon the juice into the carboy and attach your plug and airlock. 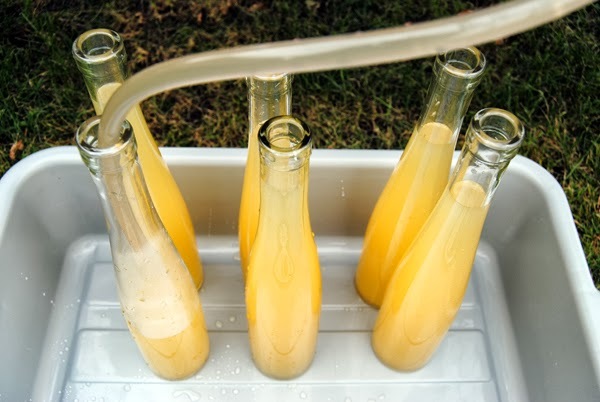 Allow the pear juice to ferment until the airlock activity subsides, about two weeks. After the activity subsides, give it another week. 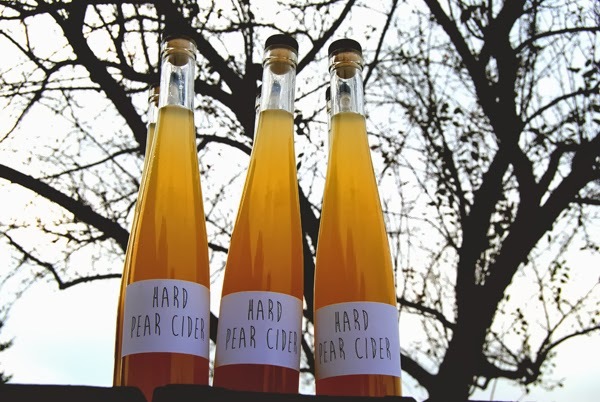 After a week, use your hydrometer to measure the final specific gravity of your cider. Subtract the final from the initial to get your percent alcohol content. Ours was a safe 12% when we bottled it. At this point, you can bottle your cider. Make sure you give it a taste to see how sweet it is. It should be somewhat dry. If so, boil 1/2 cup of water, pour in 1/2 cup of sugar, and then stir until dissolved. Mix this syrup into your pear cider to sweeten. Set the carboy in an elevated position. Place the racking cane into the carboy and fill your siphon with water. Attach the siphon to the racking cane, holding the opposite end (so the water doesn't release). Place a bucket under the carboy. 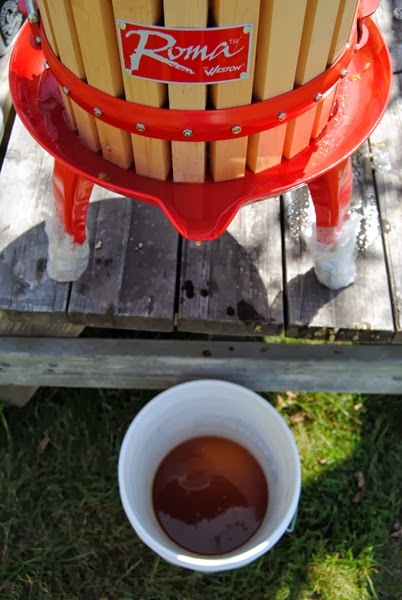 Let go of the siphon and allow the water to flow out, then quickly move the siphon into the bucket to capture the cider. Stop the siphon before the sediment on the bottom flows into the bucket. 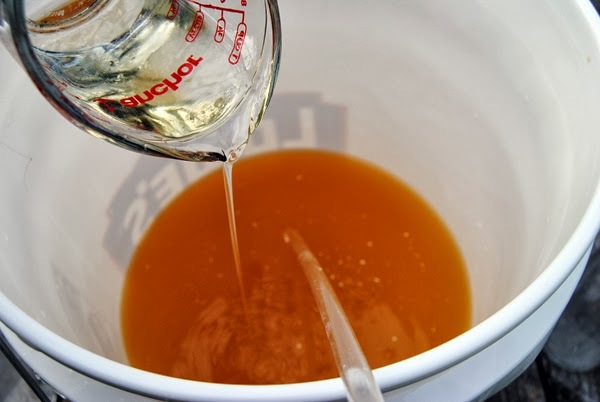 Replace the carboy with the bucket of cider and place your bottles under the bucket. Repeat the siphoning process, filling your bottles, and allowing 1" head space. You can drink it now. You can place them in a cool, dry environment to age for 3-6 months, without carbonating. Refrigerate up to a year. 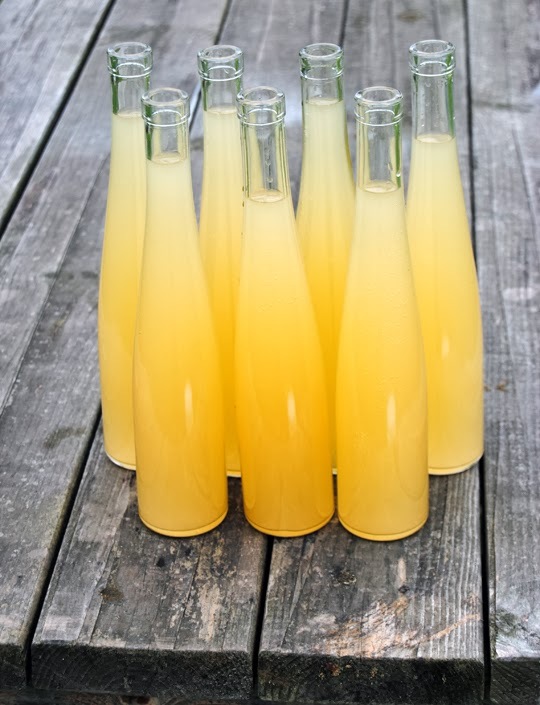 ***Update: You should place your bottles into the refrigerator after you carbonate them to stop the fermentation process so that the bottles do not explode. This recipe should definitely include a warning about creating a bottle bomb. If you seal it and allow to carbonate for as long as suggested, the bottles would most likely explode from the pressure. Google the stovetop method to pasteurize these bottles so they don't over carbonate. Putting them in the fridge should also slow (but not stop) the yeast.